Ever since I saw Conan O'Brien with jeggings my woman's mind was so blown away with his ...fierceness that it was like, suddenly, I was a PC whose screen just went blue and then delivered the message "the system just recovered from a serious error." After that show he went from "coolest talk show presenter" category to some other dirty category in my mind where I couldn't imagine Coco would ever fit in. 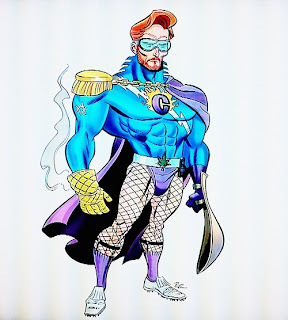 Then came the "The Flaming-C" ,superhero alter-ego, created by Conan O'Brian Warner Bros animator Bruce Timm and, although I'm not sure how a feel about a superhero in fishnet stockings ,frankly I couldn't focus anymore in any of his interviews without imagining how that costume would fit him. 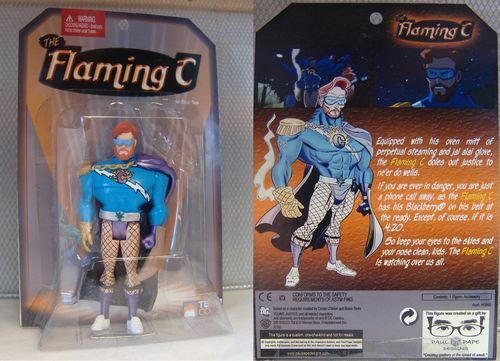 Now, The Flaming C comes to the third dimension by the hands of designer Paul Pape. How cool is this?